I recently came across photographs of something most of us never see–natural flowers that light up! The truth is almost any organic matter glows in response to UV light by what’s called “fluorescence.” As flowers are hit with sunlight, they emit a glow in return. I shared a video of some glowing flower photos at the RP facebook page. It’s not one that I created. Even if you’re not on FB, you can see some of the photos via links and a video below. Photographer Craig Burrows took the beautiful Angel’s Trumpet flower here, and has more examples at his website. I’ve included a list of links at the end of this article, and there’s also a YouTube video that features this photography linked below. Right now, I’d like to talk about how each one of us has a special light of our own, just like the unique ways the different flowers glow. Unfortunately, parents who did their best can get stuck in what one mother whose been estranged for more than two decades calls “the pit of despair.” But life really is too short to let another adult’s lousy choice define you and keep you stuck. This mother, who spent years walking on eggshells and crying, has come to the realization that enough is enough. (See the article: Parents of estranged adult children: Have you had enough?) This mom is quick to tell others, “Get out there and enjoy life.” And she’s taking her own advice. She’s letting her light shine. Abandoned parents: Will your glow show? 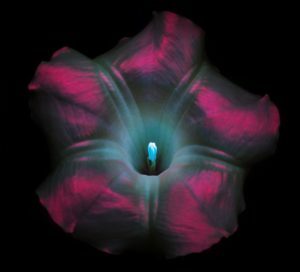 In the flower photos, we can see their glow because of a special sort of photography called ultraviolet-induced visible fluorescence photography, or UVIVF. This photography gives us eyes to see. But if the flowers weren’t out in the sunlight, they wouldn’t glow. It’s similar to what happens when we step out, smile, and interact. Some people will like us, and some won’t—but that doesn’t mean we don’t glow, just like the flowers. By stepping out into the “sunlight,” even abandoned parents who have spent years in the painful shadow of estrangement can begin to shine. All the crying you might do, all the searching for an answer that finally makes sense won’t change what has happened. You didn’t fail because of your adult child’s choices. Don’t remain a hostage to his/her decisions. What is one good thing you can do for yourself? Right now, identify at least a single thing you can do to reclaim your glow? Think back to who you were before trauma. Deep down, you’re still in there. Step into the light—and shine! Maybe this means that you literally step out into the sunlight. Despite all we’ve heard about sunlight causing skin cancer, that link isn’t as direct as you might think. And there are benefits to sunlight. In addition to increased Vitamin D with its stronger bones benefit, moderate exposure to sunlight can improve mood and promote deeper sleep—and sleep is something abandoned parents need. (Abandoned parents, here’s help with sleep.) help with. At the bottom, I’ve linked to a couple of articles on sunlight that may help. It’s not only the sunlight that helps, though. More doctors are prescribing walks in nature to help with anxiety, depression, and stress. Some of you may know that I have written several popular hiking guides for my area . At some of the most stress- and worry-filled times in my life, getting out in nature has soothed my soul. People report that physical pain improves as well. You might start to let your light shine by purposefully altering a thought habit that puts you in a bad mood. In this way, you re-ignite your light from the inside. Get a craft kit for those sleepless times. Turn to some fun reading (women might enjoy the Hot flash club series ). Meditate on calming words or scriptures. Marvel at the moon, the stars, and how vast the universe is. When we’re feeling overwhelmed emotionally, our surroundings can start to reflect that feeling back at us. Maybe our sadness shows up in yesterday’s clothing slopped over a chair, or the stress we feel shows up in a mail pile of mail we don’t look at—and that keeps getting bigger. Losing a little physical clutter has a way of clearing the mind, too. Start clearing in some small areas with big impact—like decluttering a drawer or cleaning out the refrigerator. Consider some emotional decluttering too (here’s how). There’s no need to wait until spring. Small positive changes can make you feel better about yourself, which can start to re-ignite your inner glow. For more strategies to help yourself, get my book, Done With The Crying —or read it again. Have you gotten into a rut with how you dress? Maybe you’ve spent years wearing business black. Is it time for a change? Perhaps all the stress has caused you to take less interest in your appearance. Maybe you even want to hide. Well, how about dressing to help you feel better? I’m an advocate for coming up with an outfit that helps. What’s your costume? You can read about mine here. Try adding a colorful scarf, or change up your hairstyle (or color!). Today, when a lot of young people are coloring their hair gray as a desired style, mature women are choosing to accessorize with a splash of neon pink or blue. Look it up online. You might be inspired. You can shine your light by leaving your ideas about how to shine in a comment here in response to this article. Won’t you light the way for yourself and other hurting parents of estranged adult children? This entry was posted in Latest Posts, What Parents Can Do and tagged estrangement and holidays, holidays abandoned parents, holidays estranged from adult children on December 11, 2017 by rparents. Thank you for the beautiful glow flowers- I am getting out today and walking and plan to enjoy the sun smiling down at me. I am doing puzzles when I awake in the middle of the night and it has relaxed me and I get back to sleep — thank you and hope this helps others. A heartfelt ‘YES!’ to the the idea of shining our light as role models for adult children who have lost their way. We can, indeed, be bigger, brighter and better. And perhaps there needs to be a collective response to one-sided articles like that one in the New York Times (‘Debunking myths about estrangement’, Catherine Saint Louis, 20 December 2017). I believe it’s technologically possible for petitions to be signed via social media? Maybe a new social movement is needed to counter this pandemic? Perhaps the founders of all the Facebook forums for estranged parents and grandparents could collaborate? I agree. There needs to be a much wider recognition of this. I honestly had no idea that it happened except in cases of obvious childhood abuse/neglect. Yet I am virtually certain that I made every day about giving my child the overwhelming love that shone from me, and easing his path on life as much as possible. HE was- truthfully, is – the center of my universe, although I now know that is profoundly unhealthy for the both of us, especially as his fatigue with my shortcomings becomes increasingly apparent. I’m in Healthcare, so I have a near daily opportunity to give to others, and I am grateful for that. What I know I need to do is to include myself in the list of those I give to. In doing so I believe I will become stronger and a better person to support others. Sugar, I too have been shocked at the force of nature (his fathers genetics) vs nurture (how I made choices). I won’t say he has turned out like his father as his father is a literal sociopath. But in his choices regarding me he is so often cold as ice, when I raised him surrounded by the warmth of unconditional love. BTW I love your reason for choosing your name. I wonder how many of us choose names that help us focus on our hopes and dreams for ourselves in walking this path we never choose. May the rays of the support we give each other arm you all. I am new to the group and have been reading different stories similar to mine. I’m saddened that this community exists due to the reason we are here. But I’m also thankful to have such a place to feel not alone, shame, guilty nor judged. Today is Thanksgiving and even though I’m not celebrating with all my kids, God sent some little shining lights to brighten up my day. Grandchildren and children have a way of shining. I picked the name Sugar to offset the bitter. Three sons who have abandoned me or are so abusive I’ve had to run I’m not sure its so confusing. I feel like the begging mother and I wish I could lose these mothering instincts that seem to work over time. Why are the holidays so terrible? Why do I feel so lonely during Thanksgiving and Christmas? I think it the most lonely time of the year. Reading the story of the boat is exactly how it is for me and my sons act like they enjoy the pain on my face. I wish I could do something hypnotic to not feel this. Is there a trick to getting over Sons who could care less about mom? Age 39,37,36 I’ve giving them my all. Educated them without their deadbeat dad. They turned out like him anyway. His influence won in the end. I took them to church three times a week yet its his hatred they choose to follow. I can’t see my grandkids because they want their dad to be in their lives. So her I am. Thank you all for sharing these raw emotions and helping me see that I am not alone and not some terrible Mom. I am new to this site and having read for hours now, I share all your deep heartaches. In my situation, with my Son, I feel like a ping pong ball, thinking and experiencing some progress after 11 difficult years then after this Christmas time, getting rejected again. I am feeling that I would be better off, due to both my physical health and depression, that backing away and restoring my resilience, would be better than going back and forth with this incredibly painful on-going rejection. I have realized after trying so very hard to reconcile with many approaches that I just can’t have contact with him and my daughter in law. This pain with him, is intensified because I have been replaced by his in-laws parents and family. Being a widow and alone now for these many years (doing all I can to regain my inner strength and health), I just need to finally let go. I feel deep in my heart that this will be best for me (though it may not be so for others).. I feel it is a positive step for a happier, healthier, fulfilled life. I can do it and with the strength I feel from others on this beloved site. Thank you all again. The holidays are a nightmare for me because I but them up for the kids.I wanted them to have an abundance of presents and love. I’m alone now for the holidays and I don’t know what to do. I can’t be alone. O strive to be with other people. I need to do that. It’s all about survival now. My hear is broken. My son wants nothing to do with me. He doesn’t want me to know where he’s living. he sends my postcards back. It breaks my heart. I have to find a way to live without him. Tough times. Lots of trying and I’m alone so much. Not healthy. I would like to join a support group that meets so we can socialize and commiserate. Is that possible?